Sindhi koki is a traditional and flaky Indian flatbread which made with wheat flour and dough is flavored with onion, zucchini and spices. You can serve Sindhi koki with curd, pickle, chutney, ghee or papad as wholesome breakfast. To make more flavorful koki recipe, add any grated vegetables such as radish, carrot, onion, methi and other seasonal vegetables. Koki is a flaky and crisp bread in which includes the flavor of cumin, onion, chilies and spices. It is good option for picnic, travelling or lunchboxes. You can be eaten this bread as main course or side dish as breakfast, lunch or dinner. 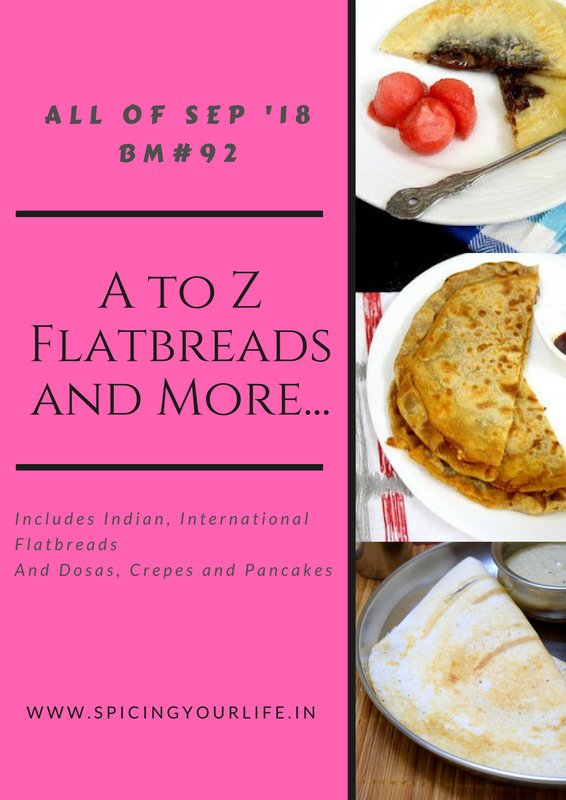 I make this recipe with grated zucchini for Indianflatbread challenge Ato Z series hosted by Srivalli. Here you can check other Sindhi recipe such as Aloo Tukk, Dal Pakwaan, Sayel Phulka, Sanna Pakoras and Dal Moong with Satpura. Peel and wash the zucchini. Grate and squeeze the zucchini to remove the excess moist. Combine all ingredients together and mix well. Add enough water to knead semi soft dough. Cover and keep aside 10 minutes to set. Divide the dough into 12 equal portions. Take one portion and roll it into 5-6 inch chapati form using rolling pin. Heat the tawa on medium flame and place the koki on the tawa. Cook the koki on both sides till to brown and crisp using oil or ghee. Repeat the same process with the remaining dough portions. Serve hot zucchini koki with curd, pickle and papad. Sindhi koki is a traditional and flaky Indian flatbread which made with wheat flour and dough is flavored with onion, zucchini and spices. Peel and wash the zucchini. Grate and squeeze the zucchini to remove the excess moist. Add enough water to knead semi soft dough. Cover and keep aside 10 minutes to set. Divide the dough into 12 equal portions. Take one portion and roll it into 5-6 inch chapati form using rolling pin. Heat the tawa on medium flame and place the koki on the tawa. Cook the koki on both sides till to brown and crisp using oil or ghee. Repeat the same process with the remaining dough portions. Serve hot zucchini koki with curd, pickle and papad. I guess this a good idea to make a kid to eat the vegetable. Thanks for the recipe. Just wowwing here, how pretty those zucchini kokis looks. Adding zucchini to the Sindhi koki makes more those flatbreads more incredible and super interesting.Ultimate kokis there. Very pretty kokis there. I am sure they taste just as amazing. It was fun to run the marathon with you, Preeti. Koki is a regular feature in our homes , but have never thought of adding any other veggies to it . Addition of Zucchini is fantastic , would make the Koki a meal by itself . Adding zucchini to koki roti is a great idea.. love the colour of your flatbread. That is a really interesting addition to koki. The kokis looks awesome. Love your styling Preeti. I have made koki and added only onions. Adding zucchini is a fantastic idea. I have never made koki before and using zucchini is such a brilliant idea. The pictures looks amazing!